Sterling has risen to its highest level against the dollar since 1981, breaking through the $2.010 mark. The currency rose above $2 on Tuesday after unexpectedly high UK inflation figures indicated further interest rate rises were likely. The Bank of England is widely expected to raise rates to 5.5% on 10 May and at least once more later in the year. The dollar, which later eased back to $2.006 against sterling, also slid to a two-year low against the euro. The pound was strengthened further by the release of the minutes of the Bank of England's last interest rate meeting at which two of nine members voted for an immediate rate rise. 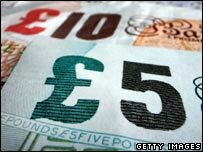 Official figures also showed that average earnings rose at an annual rate of 4.6% over the three months to February, which is the fastest rate for almost three years. The Bank of England is concerned that the current rate of inflation will encourage workers to press for higher wage settlements, which would create more inflation. The Office for National Statistics pointed out that the rise in average earnings came entirely from bonuses, but those can still be inflationary. The Dow Jones index fell in early trading, reflecting broader concerns about a slowdown in the US economy. Analysts said economic uncertainty and the fact that interest rates may have to come down to safeguard growth were behind the dollar's weakness. "Sterling's rise above $2 is a consequence of both sterling strength and dollar weakness," said Howard Archer, an economist at Global Insight. David Watt, a foreign exchange strategist at RBC Capital Markets in Toronto, said the latest movements represented a "very broad move" against the dollar. "The paradigm is shifting, with investors now seeing Europe as a main engine for growth, with higher rates, and in turn they are shunning the dollar," he added. Higher interest rates increase demand for a currency as investors look to buy into assets that offer higher yields. "The negative dollar sentiment right now is related to the US economy's potential for further slowdown and therefore rate cuts from the Fed," said David Powell, senior currency strategist, at IDEAglobal. "We do expect the US to return to trend growth toward the end of the year," he added. "But in the meantime, we could be in for a period of sustained dollar weakness and we expect that to be most pronounced against the euro and sterling in the coming days and weeks." The dollar also slid to 17-year low against the Australian dollar, worth 1.200 Australian dollars.